Hot on the heels of an exciting summer where we've seen our Tollsmart Toll Calculator apps for iPhone and Android catapult into top ten rankings in each of their respective app store categories, the team at Tollsmart is even more excited to announce the release of yet another ground-breaking innovation that eliminates the pain of collecting paper toll receipts and having to reconstruct trips for expense reporting or tax filing purposes. 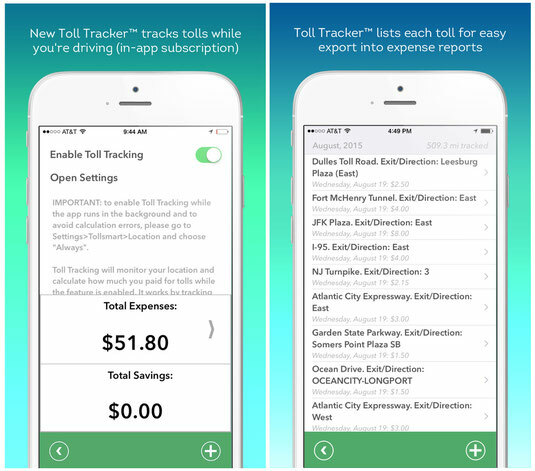 Toll Tracker™ is a new app by Tollsmart that's currently available and free for download in the App Store. It quietly works in the background while you are driving, automatically documenting the tolls and related fees as you encounter them so there's no need to take your eyes off the road. When you complete your trip you can view a list of all the tolls you've encountered along with their related costs and easily email it as a CSV file for easy importing into an expense report. The new service also tracks mileage so you can record business miles for the IRS deductible rate of 54 cents for every mile driven. If you've never submitted business mileage deductions this is like found money that can easily climb into the hundreds of dollars per trip (the trip in the screenshot above amounts to nearly $300 in deductions). One of the most exciting features of the new Toll Tracker™ service is that it tracks and displays tolls in real time, so if you use a transponder like an E-ZPass you don't have to wait until the transactions show up in your account to submit your expenses, a process that can take over a week for out of state trips. With Toll Tracker your full report will be ready and waiting for you as soon as you complete your trip. Even better is that Tollsmart works even where your transponder isn't accepted, like the Ocean Drive bridge in the screenshot to the left. This NJ bridge doesn't accept E-ZPass, but Toll Tracker has got you covered, and also displays the names of the toll facilities in plain, simple english. The ability to track and view tolls in real time also has broad application across the taxi, limo and numerous rideshare services that are now popping up across the country, and for anyone in the business of transporting people or goods. If you're a driver and don't have an easy way to tabulate tolls for a fare Toll Tracker will do it for you, while also providing a clean, documented record for your passenger. 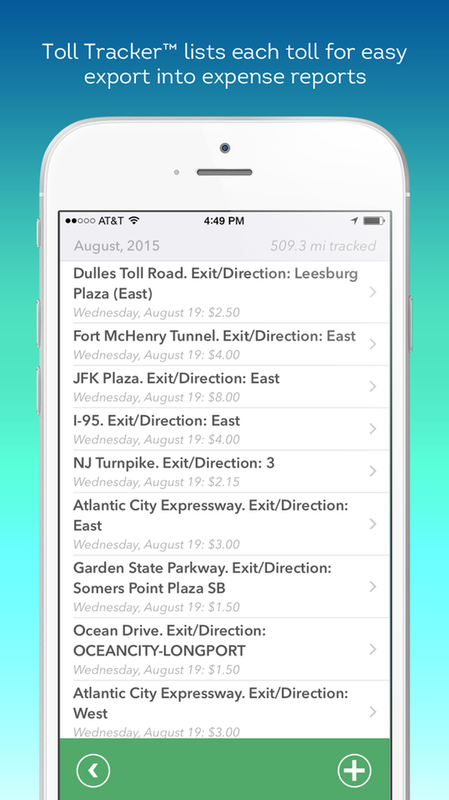 Toll Tracker™ also includes a map of your trip with push pins highlighting each of the tolls you've encountered. Tapping on the push pins provides additional details on the tolls including the cash and transponder rates. Tolls are automatically organized by month and additional features of Toll Tracker™ include the ability to delete tolls encountered for non-business purposes and to view savings achieved via a transponder account. The tolls are also stored to iCloud and so will be saved even if you need to delete and reinstall the app. Check out Toll Tracker™ today by downloading for free from the App Store and let us know what you think.